In honor of Bike to Work Day – Washington, DC on May, 18th, I thought I’d tackle 4 bike commuting myths that I think keep people from hopping on their two wheels. How does this relate to Rock Creek Runner, you ask? Well, here we focus on healthy lifestyles which both engage the earth and the local community. Biking to work is not only a great way to get the muscles moving early in the morning or an easy way to cross train, it is also one of the best ways to keep your city or town cleaner and quieter. Let’s start with my own story. I started biking to work after pressure from my girlfriend, who had been commuting by bike for awhile. I was reluctant at first because I was scared to bike in the city, I didn’t want to get sweaty before work, and I didn’t think it would really be that much better. Besides, I already had an easy commute. [youtube_sc url=tATW39U3xUM width=430]I realize that most people aren’t that lucky, but that doesn’t mean that biking has to be any different for you. So here are the top 4 excuses I hear from friends and colleagues. Now, I wish to prove them wrong. Well, yea, city biking can be dangerous. But it doesn’t have to be. After spending 15 minutes on DC streets, just about anyone will say that most bikers in this city ride like crazy people. For them, it is dangerous. If you take precautions and are careful, biking to work can be an easy ride. Wear a helmet. You might not look cool, but trust me, it is a lot cooler than a busted head. Stop at red lights. I know, it just seems too easy to blow through those bright red fun killers, but they are there for a reason, and it is the law, so please, stop at red lights. Pay attention. Cars can’t always see you. I get just as pissed as the next guy (I’ve been known to kick the backs of cars as I ride by), but many times they just can’t see you. Break out the Bells and Whistles. Make yourself heard. Invest in a bell or wear a whistle around your neck. Yelling works well too, but people on the sidewalk seem to freak. Brighten it up. When it is dark out, wear the neon, or load up as many flashing lights as you can find. Simply false. Sure, I see people decked out in riding jerseys and padded shorts every single morning. Why? I have no freaking idea. I hope that it is because they just rode 40 miles to get into the city, but I highly doubt it. I commute in my work clothes every morning. I roll up my pant legs and ride on down the road. Even in the heat of summer, mornings are usually cool enough to where I don’t get too sweaty. When I do, I just hit the bathroom for a little papertowel to the head. On the way home it doesn’t really matter! Sometimes I strip off my shirt down to just an undershirt for a cooler ride, but for the most part it doesn’t matter if I get sweaty. For the girls in the skirts, I know what you are thinking. And I haven’t ever ridden a bike in a skirt (nor do I ever plan to). But this girl has (link removed for security reasons), so take her advice! Maybe. It sometimes happens. But thankfully there are some great ways to avoid this from happening to you. Take advantage of office building parking. 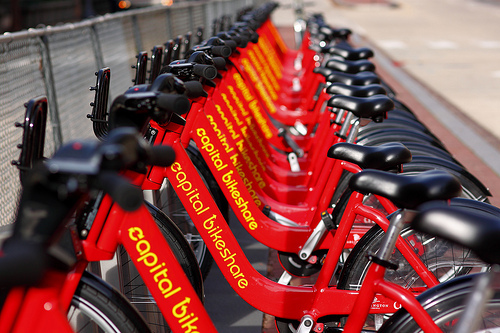 By DC law if an office building has a parking deck, they are required to have bike parking. These are usually secure and nice. So take advantage of them! If you don’t have a space at your place of work, lock your bike up in a well trafficked area or ask your employer if you can bring it somewhere in the office. Invest in a U-Lock . They aren’t perfect, but they are very strong. These suckers are WAY better than chain locks. Lock your wheels and seat. Don’t bother bringing an extra chain for your front wheel. For about $15 you can get wheel locks which will significantly reduce the risk of them being stolen. For some reason people seem to think that biking to work takes longer than other transportation. It is possible that a car is faster, but in a city, not much can beat a bike. In my own situation, I can get to work in half the time it takes me on a bus. My girlfriend, who doesn’t have nearly as nice a commute as me, can get to work 1/3 faster on a bike than taking the bus. You might be moving slower than the speed limit, but you are moving a lot faster than those stuck in traffic. You know what the best part about becoming a bike commuter is? You don’t have to commute by bike every day! If it is raining, if the temps are just too hot, or maybe if their is snow on the ground, who cares! Find another way to get to work. Bike once, twice, 4 times a week. That is fine. Just don’t let any lame excuse stop you from a better commute. Now have fun and ride safely. Most cyclists who wear tight fitting clothing do so because it’s practical. Nothing to billow out, get caught in chain, chafe against sensitive body parts. That said, your point about not needing special clothing is a good one. It even has a hashtag: #cyclewhatever. Wear whatever the hell you want to wear. For me, that means practical clothes because I’m a practical person. I ride 10 miles roundtrip year round but I don’t know if I would ride in the summer if I couldn’t shower at work. Even my downhill ride in leaves me drenched in sweat. Fair point, Bobbi! I have a few pairs of padded bike shorts and a jersey myself, which I proudly sport on longer rides. My point is that most people commuting to work in the city don’t need to feel like they should wear fancy bike clothes for their short ride. For me, it is way more practical to wear my work clothes, even in the summer. I just pack my shirt and throw it on in the bathroom when I get to the office. Thanks for writing in and reading! See you out there. Renter’s insurance (and homeowner’s from what I understand, but I’m not a homeowner) can cover stolen bicycles. Also, for commuting in the city, I bought a relatively inexpensive but reliable bike online (bikedirect.com) for $250. If it does get stolen, I’m not out a thousand bucks. Also, the DMV has information on road rules for cyclists and drivers that most people don’t even know about!